Climate change might turn lizards into geniuses, but fish won't be quite so lucky. All the billions of tons of carbon dioxide that enters the oceans each year is like alcohol for fish, turning them into risk-taking idiots. That's the finding of Philip Munday and his research team at Australia's James Cook University. The researchers place a bunch of reef fish into water with extremely high carbon dioxide levels - specifically, the level the oceans will likely reach by 2100. The fish acted erratically and started taking dangerous risks, including swimming towards odors that belong to their natural predators. If this wasn't just an experiment, a lot of drunken reef fish would have swam straight to their doom. The pair reared clownfish (Amphiprion percula) larvae in seawater with normal (450 microatmospheres) and elevated (900 microatmospheres) CO2 levels. When they reached adulthood, the fish were given a choice between a water stream containing the odour of common predators such as the rock cod (Cephalopholis cyanostigma) or a stream lacking predatory odours. Those reared in high levels of CO2 swam towards rock cod's scent around 90 per cent of the time, whereas those that had enjoyed normal levels of CO2 avoided the predator's scent more than 90 per cent of the time. The researchers were able to confirm that GABA-A was at the root of the problem by placing the fish in an environment full of gabazine, a chemical that naturally blocks the neurotransmitter. With GABA-A simply switched off, the fish regained their senses, only swimming towards the dangerous odors 12 percent of the time. Unless fish species can very quickly evolve coping mechanisms to deal with all this extra carbon dioxide, their brains could have enormous difficulty dealing with the more acidic waters of the 22nd century. While this effect has only been demonstrated in a few fish species so far, this will likely be a problem for many water-breathing organisms, including crustaceans - they all have much lower natural levels of carbon dioxide than organisms that breathe air, which makes them much more susceptible to damage from increased levels of the gas. Nature Climate Change via New Scientist. 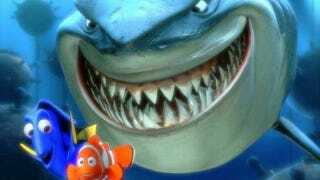 Top image from Finding Nemo, obviously.